Regular air conditioning service calls are a must in the Boulder Co. / Denver area to keep your air conditioning system working efficiently and to keep your Colorado cooling costs under control. Don’t wait until you need a more expensive central air conditioning repair performed. Regular heating and air conditioning services performed by our trained and courteous Boulder Co air conditioning service professionals will give you peace of mind in addition to saving you energy dollars. We screen our employees so you never have to worry about who is coming to your home. Quality work is the cornerstone of our business, and customer service is why our clients keep using our services. Check for and repair refrigerant leaks. Detect and correct duct leaks. Inspect and tighten the electrical connections, checking for damage. Clean the coils, drain pan, and drainage system. Remind you to replace your filter monthly or as recommended by the manufacturer. We offer an air conditioning service contract with every air conditioning installation we do. This is a air conditioning service plan that combines regular inspections with discounts on repairs and a labor warranty. In addition to the Boulder Co air conditioning service calls, including Denver and the front range, and Longmont, we are on-call for air conditioning repair when something goes wrong with your air conditioning system. To prevent this type of a call, check out our air conditioning maintenance agreement where we will come out every year and perform a clean and tune heating and air conditioning service. 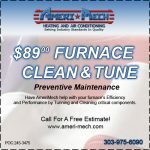 So for your Denver / Boulder air conditioning service needs, please consider calling the air conditioner service experts at Ameri-Mech heating and cooling. 303-975-6090. We are an employee owned local company based in Longmont, Colorado and service the entire front range and northern Colorado.